Bach or holiday home, 3 Bedrooms, 2 Bathrooms. Family Fun will happen here in Reilly Ave, - with loads of room to move around inside and out, great indoor outdoor flow. Reserve and childrens playground 50 metres down the road. Bring the family dog too. The carpet is worn, children have ripped wallpaper off some walls. This isn't the grand plaza, so please don't book expecting new, luxury apartment style accommodation. The nightly rate is reflective of this. We do have plans in 2019 of replacing the kitchen, painting the interior and replacing carpets, so continue to check out our photos. 3 bedrooms, large master bedroom. Ensuite with shower and toilet. Separate bathroom with bath and shower. Separate toilet. Triple integral garage, which is 1/2 carpeted - set up with 1 single bed, 1 set of bunks, also available 2 mattresses - Perfect for children, family fun and creating memories. Reilly Ave is a quiet safe street, with reserve, big enough for several games of cricket and new children's playground 50 metres down road. We have a huge cupboard full of children's toys including jigsaw puzzles, board games, blocks. Children's bikes and 2 kayaks. Optional cleaning fee of $60.00 -$80.00 dependant of numbers, for those who prefer to get on the road early. No noise after 11pm. If you are looking for a house to party in, please look somewhere else, this is a large family home in a quiet, safe neighbourhood. - We require 20% deposit to confirm the booking. Bond required for long stays and big groups. - No smoking in the house. - Noise restrictions. No loud noise after 11pm. - Don't pick fruit off the trees. Sure use a lemon, lime or 2 during your stay but don't pick to take away. We purchased Reilly Ave and furniture from Mavis who retired to a Rest Home. We like to call it Mavis's house. I travel through to BOP for work every month and use the house as a base. The rest of the time it's available as a short term rental. The decor is getting a little tired, the plan for 2019 is a new kitchen, new flooring and painting through out. Our cleaner Jan ensures it's properly cleaned/inspected between visits. It's a large family home, with a great feel. Happy to have large family groups, with 3 living areas, en suite, bathroom and separate toilet, you don't feel cramped. Walking distance to beach. Quiet location. Great indoor, outdoor flow. Quiet safe street. Available to responsible people, families preferred. Wood burner, wood is stored beside stand alone garage. Set up with bunk beds and single beds. Do not park in garage. The owners are too modest about this place - it's GREAT! Really enjoyed staying here, big rambling very spacious house that coped with our large party effortlessly. Yes the wallpaper is peeling in a few places, but so what - otherwise it's very neat, very well set out, comfortable, not lacking in anything. And it's only a few minutes walk to the beach. Very nice indeed! Would happily stay here again, and fully recommend. This house although a bit tired was spotless. It had everything we needed and was very roomy for our large group. The bottle of bubbly and the goodies were a bonus we were not expecting. Thanks very much for your great hospitality. Lots of space. A home away from home. Very comfortable. 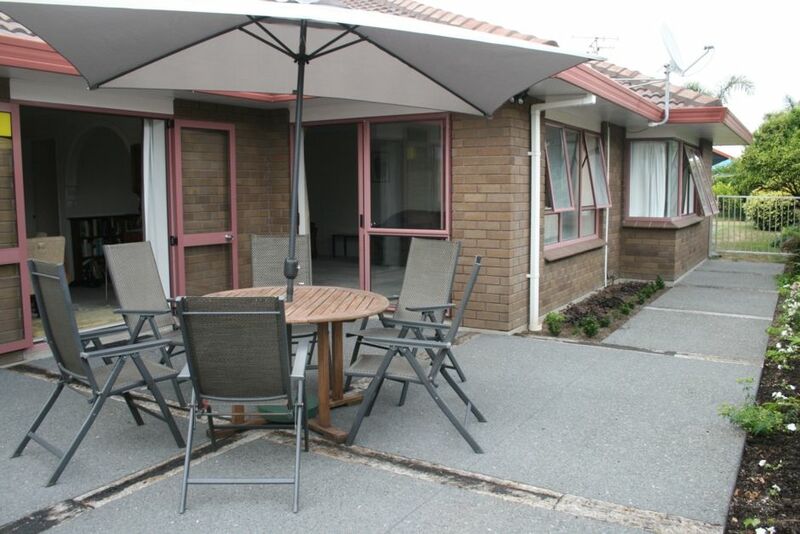 Very roomy and well situated property. Amenities at the property were very good. Close to beach and shops, easy to get to.